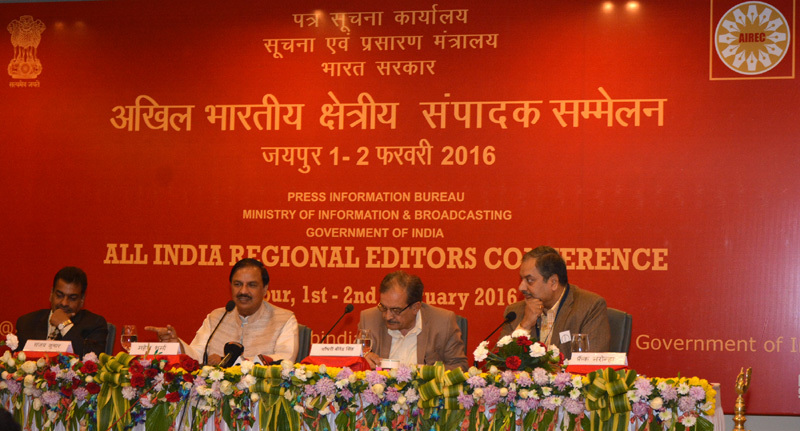 Dr. Mahesh Sharma, the Minister of State (I/C) for Tourism and Culture and Minister of State for Civil Aviation addressed the “All India Conference of Regional Editors” at Jaipur, Rajasthan today. 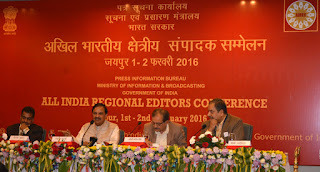 The two days Conference has been organized by Press Information Bureau, Government of India to familiarize Regional Media persons with the various ongoing programmes and schemes of the Government of India. Later the Minister interacted with the visiting media persons on achievements and many successes of the Ministry of Tourism. Dr. Sharma informed the media persons that India has moved 13 positions ahead from 65th to 52nd rank in Tourism and Travel Competitive Index as per the World Economic Forum (Davos) Report. The Minister said that Ministry of Tourism has announced the constitution of the Medical and Wellness Tourism Promotion Board on 27th September, 2015. The Board has been formed to tap the potential and advantages that India has in the field of medical and wellness tourism. The Board will provide leadership of the Government within a framework of prudent and effective measures, thereby enabling promotion and positioning of India as a competent and credible medical and wellness tourism destination. The Board is chaired by the Union Tourism Minister and consists of members representing the related Government Departments, Tourism & Hospitality sector and experts in the Medical, Wellness and Yoga. He said that his Ministry has launched a ‘Welcome Booklet’ for distribution at immigration counters to tourists arriving at international airports. The ‘Welcome Booklet’ contains information on Do’s and Don’ts for Tourists, contact details of Indiatourism domestic offices and ‘Tourist Helpline Number’. The Booklet is intended to be a helpful aid to foreign tourist immediately on arrival. The Minister informed the media persons that Ministry of Tourism has launched a 24x7 ‘Incredible India Help Line’ in December, 2014 to provide the tourist with valuable information and to guide them during emergencies. It is intended to provide a sense of security to the tourists. The service is available toll free on telephone no. 1800111363 or on a short code 1363. He said that Foreign Tourist Arrivals (Provisional) from January to December, 2015 were 8.02 million, representing an increase of 4.4% over the same period of the previous year, which was 7.68 million. Foreign Exchange Earnings (Provisional) of Rs. 1,26,211 crore during the period January to December, 2015 representing an increase of 2.3% over the same period of previous year, which was Rs. 1,23,320 crore. The Minister said that a path breaking initiative by the Government, e-Tourist Visa launched on 27th November, 2014, which enables the prospective visitor to apply for an Indian Visa from his/her home country online without visiting the Indian Mission and also pay the visa online. Till December, 2014 e-Tourist Visa was available to the citizens of 43 countries. During the year 2015, 70 more countries were covered under e-Tourist Visa regime. This facility is now available for citizens of 113 countries arriving at 16 Airports in India. During January- December, 2015 a total number of 4,45,300 tourist arrived on e-Tourist Visa while during the same period in 2014 a total number of 39,046 tourist arrived on e-tourist visa registering a growth rate of 1040.4%. The percentage share of top 10 source countries availing e-Tourist Visa facility during December, 2015 were as follows:- UK (23.81%), USA (19.59%), Russian Fed. (9.33%), Australia (5.44%), Germany (4.86%), France (4.44%), Canada (4.40%), China (3.10%), Republic of Korea (1.83%) and Ukraine (1.67%). He said that Swadesh Darshan Scheme aims at integrated development of circuits having tourist potential in a planned and prioritized manner, promoting cultural heritage of country, development world-class infrastructure in circuit destinations, pro-poor tourism approach, promoting local arts, handicrafts, cuisine and generating employment. 13 Circuits have been identified for development under the scheme namely Swadesh Darshan. The Circuits are:- North-East India Circuit, Buddhist Circuit, Himalayan Circuit, Coastal Circuit, Krishna Circuit, Desert Circuit, Tribal Circuit, Eco Circuit, Wildlife Circuit, Rural Circuit, Spiritual Circuit, Ramayana Circuit and Heritage Circuit. Three projects were sanctioned under Swadesh Darshan during the year 2014-15 at a total cost of Rs. 153.00 crore. Fifteen projects have been sanctioned under Swadesh Darshan during the year 2015-16 at a total cost of Rs. 1330.82 crores. The Minister informed them that National Mission on Pilgrimage Rejuvenation and Spiritual Augmentation Drive (PRASAD) aims at integrated development of pilgrimage destinations to provide complete religious and spiritual tourism experience. 13 cities identified for implementation in first phase – Varanasi, Amritsar, Ajmer, Mathura, Gaya, Kanchipuram, Velankanni, Dwarka, Puri, Amaravati, Kedarnath, Kamakhya and Patna. Four projects have been sanctioned under PRASAD during the year 2014-15 at a total cost of Rs. 78.57 crore. Five projects have been sanctioned under PRASAD during the year 2015-16 at a total cost of Rs. 150.77 crore. He said that the initiatives of ‘Swachh Bharat – Swachh Paryatan’ ‘Swachh Bharat – Swachh Smarak’ and ‘Swachh Bharat – Swachh Pakwan’ were announced during the celebrations of Good Governance Day on 26th December, 2014. A Nation-wide Sanitation/Cleanliness Campaign from 25th September – 31st October, 2015 was observed by Ministry of Tourism and its subordinate offices and affiliated Institutes.